Maintaining the original doesn't always mean maintaining the flaws of yesteryear's manufacturing processes. Why settle for old, worn out forgings and high metal porosity With RS's solid axle front end kits, you get the same geometrically-correct setup but with brand new tooling and a cleaner manufacturing process for a much higher show-quality appearance and performance. RS's three stages of kits allows you to pick the perfect solid axle package from basic, to Super Deluxe that include all of the parts you need for installation all in one box To customize your kit RS offers upgrade codes that allow you to custom taylor your kit to make your ride one of a kind. So when it comes time to build your dream ride RS reproduction parts has all your bases covered. For almost 40 years, Steves House Of Speed has been satisfying customers' needs by providing them with the parts they need at the lowest prices. Our huge warehouse has over 1 million parts for over 25 million different vehicles. Add to that more than 100,000 accessories for over 6 million rides and what you get is the right part with the perfect fit. No more frustration, no more stalled restoration projects, no more having to wait to get back on the road! You'll find what you want right here. We stock products that are just as good (or better) than those your ride came with. If you need your parts fast, then you'll feel right at home here with Steves House Of Speed. 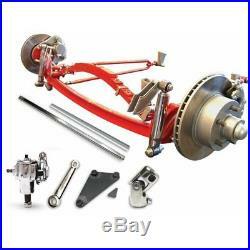 1928 - 1931 Ford Model A Super Deluxe Four Link Solid Axle Kit hot rod. 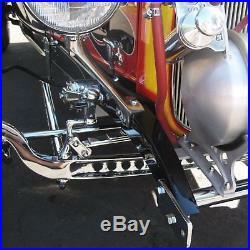 Application 1928 - 1931 Model A Ford Linkage Four Link Stage Super Deluxe Finish Raw Steel Axle Included 4'' Drop Solid Axle Spring Included Perch Standard Lower Shock Mounts Included Shackles Included Batwings Included Braket Kit Included Spindles Included Steering Arms Included Calipers Included Caliper Brackets Included King Pins Included Bearings Included Dust Cap Included Brake Pads Included Brake Hardware Included Shock Kit Included Drag Link Kit Included Panhard Kit Included Vega Box Included Vega Box Mount Included Pitman Arm Included U Joint Included Steering Shaft 3 feet Feature Detailed Instructions Feature Toll Free Tech Support Feature Designed in the USA. Stock photos may not be an exact representation of the item. Please read all product info, descriptions and terms before purchasing. All of your items fit in one box. 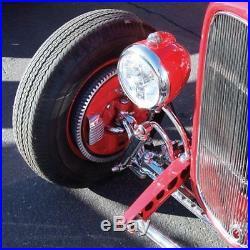 The item "1928 1931 Ford Model A Super Deluxe Four Link Solid Axle Kit hot rod" is in sale since Saturday, October 7, 2017.